Got out for a ride with the boys from work last week. We had been talking about it for awhile and had a day planned that suited us all. But the weather was doing it's best to interfere. A few are we goin or not phone calls early in the morning and it was decided to hell with the weather we're off. We had arranged to meet at the Cheltenham shop at 9am. I left home just after 8 and got gas at Feilding on the way thinking I was going to be a bit early. But when I got there the other two were waiting for me. A greeting and we were off over vinegar hill. Had to be a bit careful here as the road was wet in places, as it would turn out to be for the rest of the day. We stopped for a smoko break at Flat Hills Cafe then pushed on to Taupo for lunch. The weather mostly behaved but we did go through a pretty good down pour on our way across the Desert Road. Pulled it Taupo for a nice pub lunch at about 11:30. After lunch we gased up again and headed for Napier. It stayed nice and sunny across the plains but once we got into the hills things got wet again. Had another smoko break on the water front at Napier. Then headed off down Highway 50 and had a quick fuel stop at Onga Onga. After leaveing the weather really started to set in. With good steady rain until after we were through Dannevirke. We pulled to Daves at 4:30pm for another cuppa then it was off home. A good day out with just over 600k's under the wheels. Now all that is needed is a service and we are ready for the Grand Chellenge in a couple of weeks. With a brand new nephew to go and visit a trip up to the Taranaki & back was definitely on the to-do list. So after waking up pretty damn early for a Sunday I was up and on the road by ten past seven. Conditions were perfect leaving Palmy - nice and warm, no wind and not a cloud in the sky. There's something about early morning rides: the still conditions and lack of traffic make for a nice quiet ride. There was a few bugs out and about though and they were as keen as ever to commit suicide on my visor. 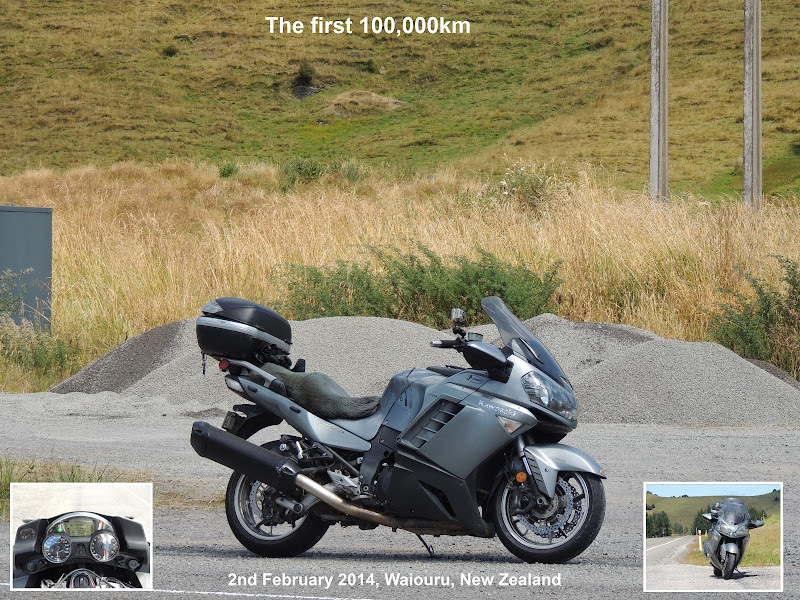 I stopped off at Wanganui for some petrol at about 8 and continued on up the road in good conditions. It was even sunny in Hawera - but not for long. Leaving Normanby a few spits soon turned into proper rain and the roads were pretty wet for the rest of the way. Another quick stop in Stratford to raid the bakery and close the vents in my helmet and I was off again. I arrived at Christine & Stu's for a much needed coffee and was soon introduced to little Billy. After lunch and a coffee with both sets of Billy's grandparents it was time to turn the bike around and head back. I left in fine but grey weather but soon had to stop to put my sunglasses on. Very warm & mild. Just south of Stratford there was quite a major detour in force and had to take a real back country loop before getting back on the main road. Started seeing a few bikes heading north and decided that some of them may be heading home from the racing at Manfield so it was time to keep a good eye out for cops. Sure enough between Wanganui & Bulls I saw 2 on the road and there was a 3rd one ticketing a 4wd in Bulls itself. Another quick top off in Bulls (327km from that tank) before heading home. Nice little Sunday ride of about 420k's. Got new tyres on Friday. So thought it was best to get them scrubbed in as soon as possible. So Andrew and I arranged to head off somewhere on Saturday. We left home just before 11am with the weather looking a bit damp. But by the time we were accorss the track things had started to improve. We gassed up at Pahiatua and headed out the back roads to Alfredton. After a short strategy meeting we decided to carry on to Pongaroa. By now the sun was blazing and things were getting quite warm. We stopped for a few minutes in Pongaroa to stretch the legs then headed off to Dannevirke. By now time was dragging on and we were both hungry and thristy so a pit stop was required. After refreshments we headed off home. Did about 300k's on a nice sunny day and got the new tyres scrubbed. Just need to get a service in a couple of weeks and I'll be ready for the Grand Challenge. Should have blogged this a while ago: a thread on Kiwi Biker about Concours accessories. Some info and genuine and aftermarket items and ramblings of a couple of Concours owners. If you're a Concours owner and have any more info on accessories etc please leave a comment here. Acres of plastic - easier to wash than all the nooks and crannies of a naked bike. Fairing will have to come off one day as stones and crap are bound to end up inside it. Big screen - took some cleaning to get all the bugs off especially those on the inside. Used a sponge to avoid scratching it. Tetra-lever - lots of nooks and crannies hard to get at. Wheels - a bit finicky but most importantly: no chain so no crap all over the rear wheel. Front worst to clean - huge discs, big guard, brake dust & wheel design. Overall it cleaned up pretty quickly and easily and is ready to get dirty again. 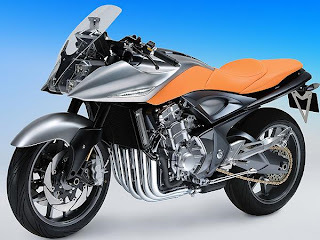 Thanks to the Kiwi Biker I found out some interesting scuttlebutt: the Suzuki Stratosphere is supposedly going to be released in 2009! Yeah baby! 1100 six! During the week Mark had suggested that I was to take him on a bit of ride on Saturday. 800km was the distance talked about. Sounded ok in principle and it gave me something to look forward to. Oh, how things can change in a few days. Saturday morning I was up and about reasonably early ready for the phone call to say that we were off. Come nine and still no call so I grabbed the phone and rang Mark. Answering from his bed he was still keen but nowhere near ready to go. He suggested that I head into town and get some new gloves (I'd been looking at some the night before) and then pop out and pick him up. Gloves bought, I was soon heading out to Mark's and looking at all the dirty clouds hanging around wondering where we should head. I had a pretty good idea where I wanted to go but didn't necessarily want to get drowned while doing it. Heading off from Mark's I took the Opiki road to get us over by the ranges without having to go back through town. In and out of showers and I was really wondering about my route - and how Mark's brand new tyres were doing on the wet roads. We seemed to come out of the weather just south of Palmy so I thought my plan was still a goer and we turned off Old West Road and then off over the Track. Stopped of in Pahiatua for some gas before heading out into the wops behind Pahiatua. This was only the second time I'd been out here and I made one wrong turn before finally finding our way into Alfredton. The weather over this side of the ranges was getting warmer with every k we ticked over so the screen came down on the Concours and the visor on my helmet came up. Heading up route 52 to Pongaroa was awesome. Great back country roads with some awesome corners. A little care required in a few places where the road is still quite badly storm damaged. A quick stop off in Pongaroa to take some gear off - glad I took my panniers and then it was on to Weber then Danniverke. Great road from Weber to Danniverke that the Concours & Bandit just ate up. We had a late lunch in Danniverke before heading home via the main road. Not quite the 800k's planned - actually just under 300 - but a great ride all the same. Looks like the weather has finally changed for the better so there'll be plenty more good riding to be done. Mark gave me a ring this morning from Taupo and said that he would be taking off back to Palmy in about half an hour and did I want to meet up somewhere on the road? Well, ok then. So off I went. A pretty good day weather wise with just a bit of wind in some places to knock you around a little. I ended up meeting up with Mark & Shelley at Waiouru just as they had pulled up to get gas. Had a wee ride on Mark's Bandit back to Flat Hills just to reminisce a bit. A quick stop for lunch and then back over Vinegar Hill and home. This gave me about 630k's for the weekend. Also got my best mileage to date on the Concours. I filled up in Taihape yesterday, did Waioru-Ohakune-Wanganui-Palmy and back to Taihape again on 20L. This was a distance of 336k's and gave economy of 6.1 L/100km. Good to know that the bike can do the required (by me - don't want to be stopping every 5 mins for gas) 300km to a tank easily. 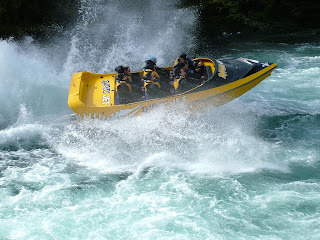 Shelley and I had had a jet boating trip booked in Taupo for a few weeks. So with the forecast looking ok I managed to talk her into going on the bike. She was a bit nervous to start with as this was to be her first long trip. With the gear packed we were ready to go just after 9am. We headed out via the usual route through Vinegar Hill. Andrew had decided to tag along some of the way with us too. After a few spits of rain but nothing to get things too wet we pulled into Taihape for some gas and a cuppa. Shelley was getting into the swing of things by now all be it a bit chilly. We continued North and left Andrew at Waiouru, where upon we attacked the Desert Road. It was pretty much a trouble free section and we pulled into Turangi for an early lunch. After lunch we cruised through to Taupo and checked into our motel. Then headed off for our jet boating excersion. Next morning we had a cooked breakfast in Taupo and phoned Andrew to meet us at Waiouru for the homeward trip. Once again we had good weather through the Desert Road and pulled into the Caltex at Waiouru with 300k's showing on the trip meter for that tank. While we were getting petrol Andrew pulled in. Good timing. We swapped bikes so I could have a ride on the Concours and headed for Flat Hills for a cuppa. After a quick stop it was back over Vinegar Hill and home. Mark & Shelley's plans called for a stop at Taihape for coffee so this would be a good turning back point for me or would it? 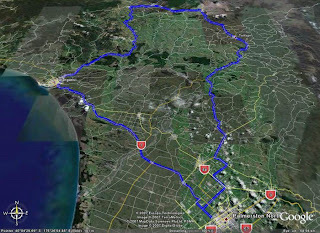 We had a nice ride over Vinegar Hill and up the main road to Taihape and all the way I was thinking of possible extensions to my little pootle: Taupo-Napier & home; Taihape-Napier-Palmy or Waiouru-Ohakune-Wanganui-Palmy. 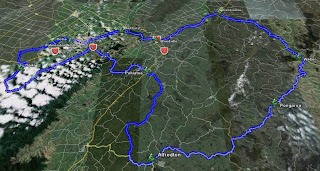 By the time we'd had our coffee I'd decided on hitting the Paras so I continued onto Waiouru with the others before turning off towards Ohakune. There were a few black looking clouds and the odd spit of rain between Ohakune and Raetihi but otherwise it was pretty fine. I'd been playing with my new heated hand grips but in the end even on 50% it was too warm for them. The Paras were there usual rugged self and there was quite a bit of stock (ewes with their lambs) on the road just south of Kakatahi so a fair bit of care was needed. The roads are still pretty rough in places and coming into one corner I actually had the ABS come on which gave me a bit of a fright. I'm sure that it was the corrugations upsetting it as I was not braking hard - something to remember in future. The rest of the ride was pretty uneventful except for catching up to a mufti cop just south of Bulls. He didn't seem to worried about my sudden appearance and even let a van get away with passing the both of us at probably 20 km/h over the speed limit. Nice little ride of approx 350k's and back home by 1pm for lunch and chores.